I took an unplanned break for the garden. I didn’t intend to, but between going out of town, my birthday and some fabulous World Cup games, the garden fell by the wayside for a week. Now I’m regretting it. So yes, I’m absolving myself of any responsibility for the state the garden is in and placing the blame squarely on the World Cup. It only happens every four years! How could you not stop to watch the 32 best football teams on the planet, especially come the knockout rounds? I’ve chosen to use the correct term for the sport instead of the American term for anyone who may be confused. The announcers are rubbing off on me. So this afternoon I visited the garden for the first time since early last week. It ‘s rained a few times since then so I wasn’t concerned about the garden lacking water. 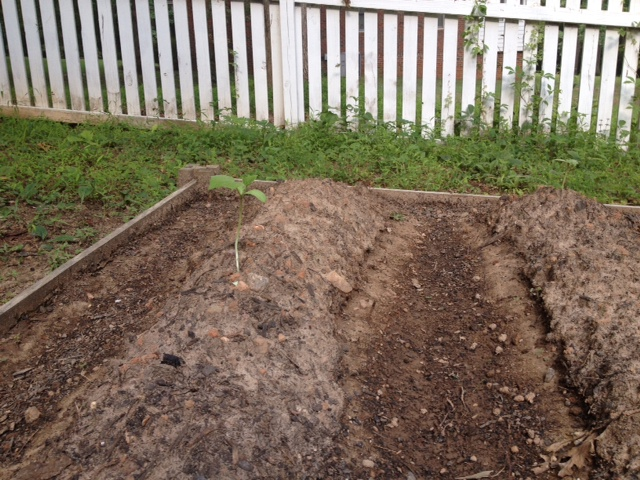 But one of the watermelon plants was completely withered and sitting on top of the soil. A couple of areas in the large box had been dug up. Once I poked around, I discovered ants, maggot like creatures and small, round balls which I guess are eggs of some kind. Weeds are starting to proliferate in the smaller box. I’m going to look at this unintended break as halftime and use it to regroup. I’m going to do a better job of staying on top of what’s going on in the garden and tending to it. The fence around the garden is still in the works. I sprayed the ants and other bugs with a vinegar and water mixture I found online. So hopefully that will help get rid of them. I’m going to do a second planting to see if that produces better results. I’d really like to have some produce to enjoy out of the garden this summer. We’ll see how the second half of the summer goes with the garden. If you have any advice to share, please send comments, ideas, etc. my way! 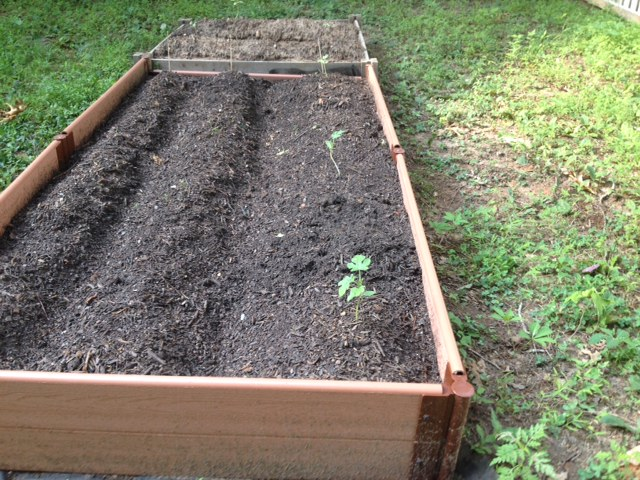 One of the reasons I started a vegetable garden was to have access to fresh healthy foods. I try to eat a lot of produce already. In fact, I subscribe to Veggie Van, a weekly CSA type service where I pay a flat rate and get local fruits and vegetables for a low price. I love my Veggie Van! (Gratuitous shout out over.) I thought that having my own garden could help me even further in the pursuit of a diet full of whole foods. Recently I started reading Salt Sugar Fat by Michael Moss. It talks about how the processed food industry has used those three ingredients and a mix of marketing to get us hooked on convenience foods. I’m not too far in but I’ve found it very interesting reading so far. One thing that really stood out to me is that I’ve heard that you should eat like your grandparents ate meaning more natural and whole foods and less of the processed stuff. Convenience foods started getting popular in the mid-1950s when women were entering the workforce more and couldn’t spend all day in the kitchen. It turns out eating processed foods is how our grandparents ate! Not all of them of course, but more than I originally thought. Another thing that has motivated me to limit my intake of processed foods (which is extremely difficult since I certainly love my sugar and desserts) is a challenge that a couple of my coworkers have taken on. Chasity and Chelsea are going the entire month of June without eating sugar, bread, dairy, fast food or processed foods. While I know I could never give up bread, dairy or sugar, watching them go through the challenge has inspired me. They’ve been coming up with creative new recipes to make up for what they’ve taken out of their diet for the month. Since they started, I’ve found myself cutting back on breads and desserts. I would really like to make an effort to make desserts from scratch but I’m not quite there yet. So all in all I’ve got several sources of motivation to eat more whole foods. Don’t get me wrong, I’m not giving up sweets or processed foods entirely; I’m just trying to eat a little less. Much like pimpin’, gardening ain’t easy. At least for a beginner. Well, remember when I said that the garden wasn’t much work at this stage? I was wrong, very wrong. I’ve been watering the garden regularly and monitoring plant growth. I think most of you know about the pest that’s been visiting. I’ve come up with a solution for that problem. The next free weekend I have, I’m going to build a fence around the garden. 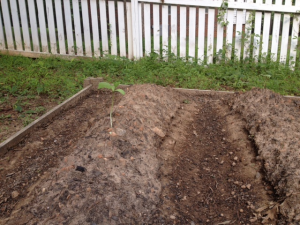 The other issues I’m having are an ant invasion, possible drainage issues, and soil erosion in the smaller bed. I was fixing a hill that had been dug up this weekend. 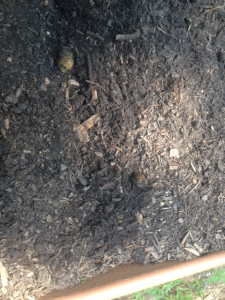 When I was turning the soil, I noticed something that looks like larvae crawling around. I’m guessing it’s ant larvae, but I could be wrong. One non-harmful solution I’ve found is a mixture of vinegar and warm water. You spray it at the edge of your garden and on any mounds you find. 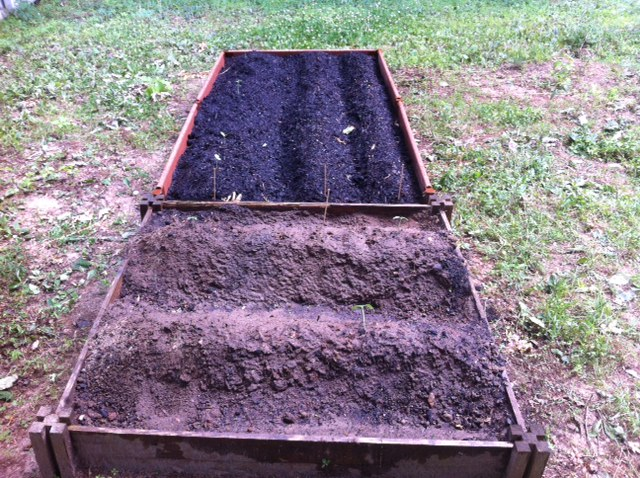 The mixture doesn’t affect the plants and is supposed to get rid of the ants. I plan to try that this week. Late last week I found something funky growing at the edge of the larger bed. I was pretty grossed out by it so I pulled it up before I thought to take a picture. I thought it could be a fungus. We’ve been getting a lot of summer storms and rain lately so the garden bed is pretty much saturated. Whatever it was hasn’t popped up again, but I’m keeping a close watch. If the bed isn’t draining properly, I’ll have to create a drainage system. 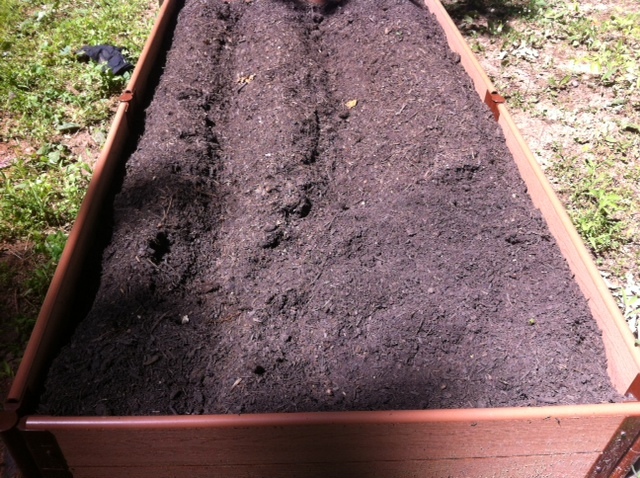 Since the heavy rains last weekend, the soil in the smaller bed has become compacted. The mounds are much smaller and I’ve discovered rocks that were hidden under the hills previously. When I first set up the garden, I put most of the purchased soil in the new bed. The smaller bed mainly had the original clay-like soil. I meant to go back to the store and get more soil and compost, but never got around to it. I’m adding that to my to do list as well. The waste of my garden pest. Can anyone identify? 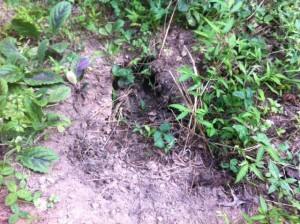 Using my first-rate detective skills, I’ve determined that I’ve got a woodchuck creeping in my garden. 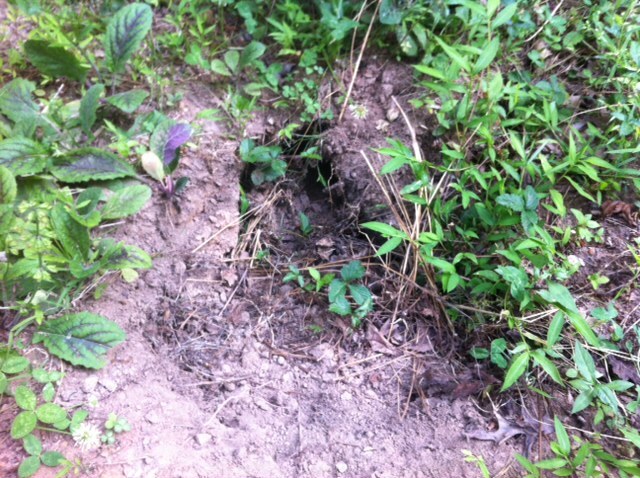 There is a large hole not far from the garden which I assume is the entrance to its burrow. There is another smaller hole a few feet away which would be a second entrance/exit. After doing extensive research (checking out Wikipedia), I’ve learned that a woodchuck and groundhog are one and the same. Groundhogs sound much less intrusive, I mean who doesn’t love Punxsutawney Phil? What do woodchucks have going for them- that awful cider? The most interesting thing I found out about woodchucks/groundhogs are that they’re sometimes called whiste-pigs. I’m too lazy to look up the origin of the name but not too lazy to find out that WhistlePig is the name of a whiskey brand that was featured in an episode of Breaking Bad during the final season. You are welcome for that useless fact! I think my best bet for dealing with the woodchuck/groundhog/whistle-pig is to build a fence around the garden and stake it firmly in the ground. This will require digging about a foot down to make sure the garden is protected. This will take some planning and building. I’ll have to figure out too how to build a gate for easy access. I’ll keep you posted on my progress. I’m now in the maintenance phase of gardening. The initial high of starting my own garden has started to fade. It’s kind of like the period a few weeks after the wedding. Once the party and celebration are over, you gotta deal with the day to day stuff. My husband’s pretty awesome and I was very happy to marry to him, but the honeymoon period eventually ends. Real life has a way of doing that. Anyway, that’s what’s happened with my garden; I’m out of the honeymoon period and I’m now keeping up with the day-to-day. I’ve been tending to my garden by watering every other day and weeding regularly. 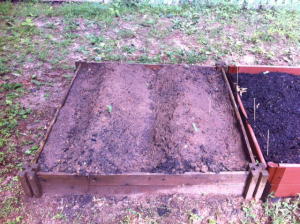 Actually, I’ve only been weeding the pre-existing 4X4′ bed. The 4X8′ bed with the soil and compost mix and lining doesn’t need to be weeded. Awesome! 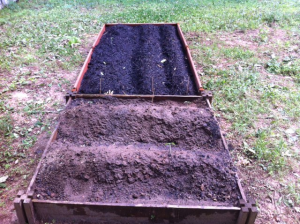 Note to self- next year start from scratch on the smaller bed and get new soil for less work. Come next spring, I’m sure the future me will be saying thanks for the tip. The garden is less work than I thought it would be at this stage but then again the seedlings still aren’t very big. I have to admit it’s really cool to see the seeds I planted just a few short weeks ago grow into actual plants and eventually food! I planted six cucumber seeds and three are growing. I had a fourth but I accidentally pulled it up when I was weeding the smaller bed. Whoops. 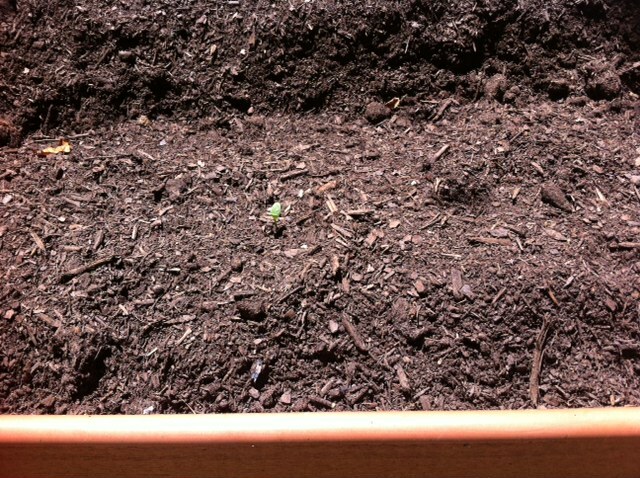 I planted six watermelon seeds and out of those, four sprouted. After they got to be about 3 inches tall, I had to thin them out to three. Easy enough, I just plucked one from the dirt. Later that week, I wish I would’ve left it. What I suspect is my garden pest had pulled up the third one so I was left with two. Not cool. 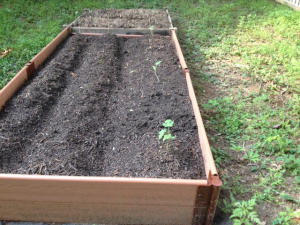 The carrots and lettuce are still pretty small but they’re growing slowly but surely. Below are current views of my garden. View of both beds with a little green. Who or What’s Been in My Garden? Last post I wrote about some animal using my garden for their own personal bathroom. I guess the garden’s location and aesthetics appealed to whatever animal plopped down and marked their territory there. My assumption that it is indeed a what and not a who. I really hope I’m right on that one. If I want to stop this animal from getting into my garden, I have to figure out what it is so I can choose the best strategy. I don’t want to go all Taken on whatever it is; I’d rather deal with it humanely. There is a hole about 10 feet from my garden. I put out an appeal to find out what it could be and my good friend Becky sent me this site. Thanks Becky! The page helps identify animals pests by what their ground holes and waste look like. The ground hole in my yard is to the right. Our backyard is wooded and near creek so the possibilities are endless. By using deductive reasoning and the above guide, I’ve narrowed down the possible critters to a raccoon, rabbit or woodchuck. I’m thinking the best strategy is to build a chicken wire fence, 2-3 feet high around the perimeter of the garden. I haven’t seen any evidence of burrowing, just damage on top of the garden. If anyone has any other ideas on how to stop a garden pest, I’d love to hear them. You can see the tiny green sprout if you squint really hard and look closely. 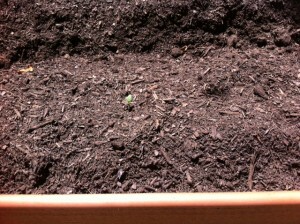 Little seedlings are starting to sprout in the garden bed! It’s been a little over a week since planting and they’re very small right now but I can tell that they’re seedlings and not just the beginning of weeds. It looks like I’ll have some vegetables this summer! You gotta take the victories when they come, right? Even if they’re small. While I have my first small success to enjoy, I also have a potentially big problem. Tending to my garden recently, I noticed that something had ruined my nice distinct hills. Some unnamed animal had dug up a couple of the rows and then decided the garden would make a nice toilet. This is an issue for multiple reasons the least not being, the animal messed up my pretty rows! Now I have to play detective and figure out what kind of animal this is so I can properly deal with it. Which is great because I love the ID channel and I love playing detective. Like the time when I noticed my neighbor was out of town for an extended period of time but there was a strange car at his house and a couple of strangers going in and out. I became convinced that the two people had killed my neighbor, hid the body and were squatting in his house. Well, a few days later, my neighbor reappeared safe and sound. It seemed he was just out of town and the two strangers were house sitting. I guess being obsessed with the ID channel is not a good thing. Hopefully I won’t be wrong in this case of playing detective. I’ll put my detective hat on and report back.